In the next couple of weeks I have the incredible blessing of reconnecting in person with two of my dearest friends and favorite people on the planet. One lives in New York City. The other in Southern California. Both of them I have known nearly half my life,yet I have seen neither of them face to face in years. But I know that there will be no awkward silence in our times together. I doubt there will be much silence at all! There is much to catch up on, much to share, and there is life to be lived; two moments that I anticipate will be memories that last a lifetime. Do you have friends like that? Friends who know you better than you’re really comfortable with, because they know your best AND your worst? The idea of being in relationships like that used to terrify me, because the idea of revealing weakness or imperfection terrified me. But in the last few years, I’ve begun to see how God created us with an inherent desire to both know and be known. As He is in relationship, both in Himself as the Trinitarian God, and with His creation, we are created in His image to also be in relationship with Him and with others. And, I have learned, to know and to be known is the only true way in which to extend and to experience grace. Only when we are known at our deepest levels, when we are transparent enough to bear our souls and risk rejection, do we also open ourselves up to receive the most genuine act of love; to know someone and love them anyway. This is why I am so excited about reuniting with these friends; they know me, and that no longer scares me. I can be myself and that is celebrated, not critiqued, examined or judged. Just loved and challenged and encouraged. Who are the people in your life who love you in spite of yourself? Who are the people you love in that same way? In other words, with whom are you practicing the love of Christ? My parents have lived in the same subdivision for nearly 17 years. I’ve been running in that neighborhood for nearly 17 years, and I’ve been running practically the same route the entire time. It’s predictable, challenging (but not too much), has several little dead end streets you can add for extra elevation, time, and distance. It’s a good, mindless route. Since moving back to cut expenses while I finish school, this route has been physically more challenging than it used to be. In fact, I haven’t even been able to run the entire route. I stall out at about the same place every time. I thought it was just b/c of being older, or trying to get back into shape. But it hasn’t gotten any easier, even though I can run farther and faster other places, and lately I began to realize why. It’s not any more physically challenging than it ever has been, but one particular part of my old route has dredged up particularly painful memories, some nearly a decade old, some fresh, in the last few months. My stall outs haven’t been physical, they’ve been psychological. They’ve occurred when I’ve gotten distracted with the “whys” and the “what ifs” attached to the houses I pass. Instead of running being a time when I clear my mind, refocus on God, commune with Him, my running became a time of reflecting on the past and regretting much of it. It literally weighed me down til I had to walk. And today, I just couldn’t do it. This part of my run is nearly a mile, and it’s relatively flat, but I couldn’t do it. But I had four miles to run, so I had to do something. So I chose another route. 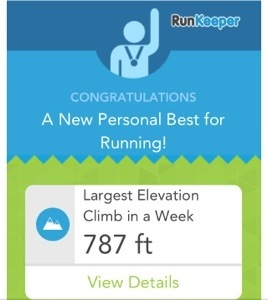 And not only did I run it, I hit an elevation PR. Pretty cool. To some, that may seem like the obvious thing to do, but how many times to we do that in our own lives, in relationships or other issues? How often do we find ourselves limping down the same painful road over and over again when all we have to do is pick a different path? The temporary pain of the new uphill challenge far outweighed the familiarity of the old, downhill pain. I know that old route will always be there, and one day, when those emotional wounds have healed, I can run it again. But in order to leave that old route and go a new way, I had to get to the point at which the benefit of facing a new challenge outweighed the pain of constantly reopening old wounds. So how does that relate to our spiritual and relational lives? When we’re “trapped” in a spiritual rut or an unhealthy relationship or other situation, what stops us from taking the challenge of trying another route? Is the same old pain and heartache at least familiar, and we’re not willing to risk that a new challenge may be even more painful? Remember this: “If the Son has set you free, you are free indeed.” The new challenges we face with Christ can be difficult; but we will never face them alone. Sometimes, all it takes to break free from a long term cycle of pain is to just pick a new path. Which path will you pick today?